The first part of our Military Times Afghanistan series begins in Issue 1, with an in-depth chronicling of the British army’s disastrous retreat from Kabul. After installing an unpopular ruler and corrupt government in Afghanistan, aiming to create a puppet government with which to control trade routes and defend India, the British lost the respect and cooperation of the Afghan people. Ineffective retaliation against the killings of British troops and leaders gave the impression of weakness, and negotiations to withdraw ended only in the duping and killing of the British Chief Representative in Kabul. Return to India was the only choice: this map depicts part of that route, and the events along it. In the bitter Afghan winter, 4,500 soldiers and 12,000 camp followers left Kabul. Panic amongst the latter saw many provisions abandoned; the chain of command was irrevocably broken. The first night saw them only five miles from Kabul, in a disorganised camp, flimsy against the cold. Next morning, many were left where they had laid down. Constantly under attack from snipers hidden in the mountains above them, the British were unable to reply, equipped only with short-range muskets. Coming up to the Tangi Tariki Pass, they found the way blocked by Pashtun tribe the Ghilzais. Most of the column was slaughtered, the rearguard almost totally wiped out. Akbar Khan, son of the emir of Afghanistan who the British had replaced with Shah Shuja, extended an invitation to Major-General William Elphistone, commander of military operations in Afghanistan. He accepted, only to find himself taken prisoner. Brigadier Anquetil now commanded what was left of the British forces in Afghanistan. Hoping to use the cover of night to slip past the waiting Ghilzais, they found the way once again blocked. 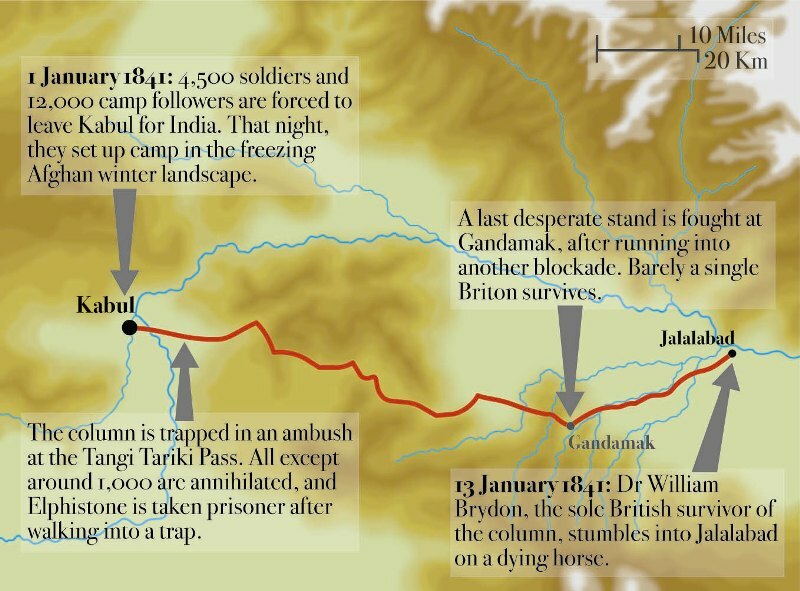 A desperate last stand at Gandamak wiped out every member of the British battalion the 44th Regiment of Foot, except nine who were taken prisoner. By the time Jalalabad was finally reached, the once 16,000-strong company was reduced to a band of 40 men. One Briton survived to tell of their destruction, Dr William Brydon. Dramatically weakened, riding a dying horse, the tale he told shattered the myth of British invincibility in Central Asia.